Active Ingredient - Purpose. Eugenol 1.2% - Oral Pain Reliever. Inactive Ingredients: Flavor, Glycerin, Polyethylene Glycol, Sorbic Acid, Sorbitol, Sucralose, Water. 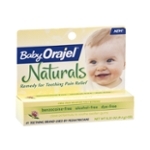 Warnings: Allergy Alert: Do Not Use This Product If Your Baby Has A History Of Allergy To Clove, Its Component Eugenol, Or To Balsam Of Peru. Do Not Use: More Than Directed. For More Than 7 Days Unless Told To Do So By A Dentist Or Doctor. When Using This Product: Fever And Nasal Congestion Are Not Symptoms Of Teething And May Indicate The Presence Of Infection. If These Symptoms Do Not Go Away, Advise Your Dentist Or Doctor. Stop Use And Ask A Dentist Or Doctor If: Sore Mouth Symptoms Do Not Get Better In 7 Days. Irritation, Pain Or Redness Does Not Go Away. Swelling, Rash Or Fever Develops. Keep Out Of Reach Of Children. In Case Of Overdose Or Allergic Reaction, Get Medical Help Or Contact A Poison Control Center Right Away.